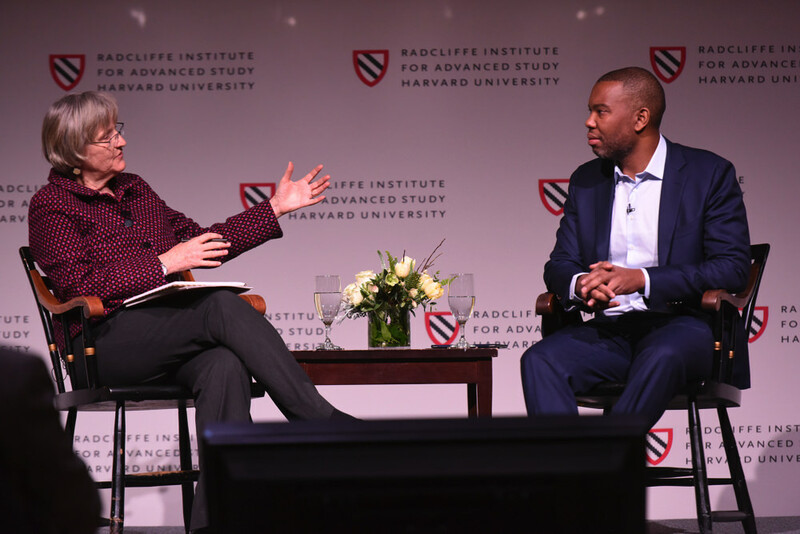 Harvard University President Drew Gilpin Faust spoke with journalist and author Ta-Nehisi Coates after his keynote address. Coates was talking about slavery’s colossal formative influence on American history, from the founding to the present; but universities, too, have been finding out in recent years just how deep their own roots are sunk into, as Harvard historian Sven Beckert phrased it Friday, “the violence of the slave trader, the Middle Passage, the auction block, and the whip.” Researchers at Yale, Princeton, Brown, William & Mary, the University of Virginia, Rutgers, Georgetown—and Harvard—as well as other schools, have uncovered sometimes extensive historical connections to slavery: slave owners among the faculty and administration; significant gifts from slave-owning donors; endowment money and investments in the slave trade; campuses built and subsidized in part by slave labor. University scholars authored many of the racist scientific theories that legitimized slavery’s existence. One reminder of that scholarship on Friday was the shirtless man staring out from the conference program. Radcliffe dean Lizabeth Cohen explained that his name was Renty, a Congolese-born slave whose daguerreotype image was taken in 1850 on a South Carolina plantation and commissioned by Harvard professor Louis Agassiz. A biologist and geologist and a student of Earth’s history, Agassiz developed the theory of polygenesis, which denied the existence of a common human ancestor and held that blacks were inferior to whites. The Renty daguerreotype, along with others from Agassiz’s tour of Southern plantations, was lost for decades, until archivists at the Peabody Museum rediscovered it in 1976. Other speakers, including Faust, echoed that same sentiment, though with less specificity. “We cannot successfully move forward as a university, as a nation, or as citizens, without acknowledging this history and making it important to the understanding of our present,” said Harvard’s Beckert. “And to be meaningful, that acknowledgement will have to have economic and political consequences; it cannot be purely symbolic or rhetorical.” Stanford historian James T. Campbell, who a decade and a half ago led Brown’s effort to research its own past, said, “There has to be some response in the present to what you know about the history.” Conceding the impossibility of any full remedy, he added, “Nothing you do in the present even approaches the significance and scale and scope of the crime. That doesn’t mean you can’t do anything.” Adam Rothman, a Georgetown historian involved in that university’s archival effort, asked how many in the audience thought his university ought to help subsidize the education of people descended from slaves that it had owned in the early 1800s. Most hands went up. Seated beneath an image of the daguerreotype of the slave Renty, panelists (left to right) Annette Gordon-Reed, Sven Beckert, Alexandra Rahman, Daniel R. Coquillette, and Julian Bonder spoke about the legacy of slavery at Harvard. There were worse stories. Daniel Coquillette, Harvard Law School’s Warren visiting professor of American legal history, and the author of the 2015 book, On the Battlefield of Merit: Harvard Law School, the First Century, gave an account of Isaac Royall, whose bequest led to the 1817 founding of the law school and whose newly revealed slave legacy roiled the campus last year with intense protest and controversy. A West Indian planter and strikingly cruel man, Royall owned a sugar plantation on the island of Antigua during the eighteenth century. Sending gasps through the audience, Coquillette described how Royall brutally suppressed a major slave revolt there in 1736. More than 350 slaves had mobilized, but “at the last moment,” Coquillette said, they were betrayed. After it was over, 77 slaves were burned at the stake, and six others were drawn and quartered. The leader of the uprising, a slave named “King” Court, was gibbeted alive. As the day wound on, researchers from other universities shared experiences from their own excavations. Campbell, now at Stanford but previously at Brown, recalled how the research effort got under way there in 2003, when Ruth Simmons, then Brown’s president—and the first African-American president of an Ivy League university—announced that a steering committee would investigate and publish the school’s ties to slavery. “This was a moment of transcendent courage,” Campbell said. And although the announcement made news around the world, “there wasn’t a single peep from another university even suggesting that this was an act worthy of the university,” Campbell said. “Certain people just kind of waited to see.” Brown’s groundbreaking report, “Slavery and Justice,” published in 2006, inspired Beckert to launch his research seminar the following year. At Georgetown, Rothman, too, said he had been overwhelmed by the “emotional power vested in archival material.” That university’s recent investigation turned up evidence of the Jesuit-owned, slave-worked plantations and farms in Maryland that supported and sustained Georgetown’s educational and religious mission. Enslaved people also worked on the campus itself; at one point, Rothman reported, about 10 percent of all people on campus were slaves. The most devastating revelation, however, revolved around a sale in 1838 of Georgetown’s last 272 slaves, for the sum of $115,000, which was used to pay off the university’s debts (and keep its tuition free for students). Wading deeper and deeper into the day, as panelist after panelist talked about the profound effects and long roots of slavery, and the moral imperative to do something about it—even as that something remained not fully known—there was a gathering sense of the enormity of it all, that as these investigations have become easier to embark upon, they have also taken on a kind of inevitability. The problem is knowing how to proceed once the history is out there, how to find what is possible, how to get it right. Campbell said that the Brown steering committee members spent as much time agonizing over the report’s five pages of recommendations as they did discussing the historical research.